Natural rod holder lends you a hand. See TALS Tubes in Action! See Chest Pack in Action! Includes 8 patented TALS Tackle Tubes. Prevents tackle clutter, tangles, and spills. "Hands free" fold down work table with tool holders. Spacious front pocket with 3 jar bait holders. Ventilated to prevent tackle rust and mildew. Easy to rinse and hang dry after a day in the salt. Light and comfortable all day wear. Converts between a chest pack, a waist pack or a satchel. Wade, surf, kayak and float tube fishermen this pack was made for you. Designed to provide spin fishermen with a complete and organized tackle storage system that can be worn in comfort as a chest pack, waist pack or satchel. 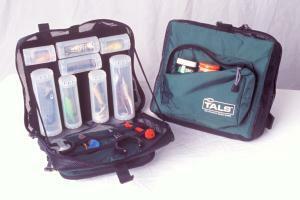 The patented, twist action, side access TALS Tubes sets this tackle tote apart from the rest. These rotating, worm proof, storage tubes have an internal latching mechanism to prevent from jarring open and use hook and loop to secure inside the pack. Never before has it been so convenient to store spin tackle safely at your fingertips. The entire pack and tubes are ventilated for quick drying so there is no need to worry about storing wet tackle. Pack has a spacious front pocket with 3 jar bait holders, 2 side D-rings, and a fold down, hands free, work table/rod holder complete with elastic straps to secure pliers, spinnerbaits, hook remover, pen light, knot tier, knife and more. Pack dimensions 10"x 9"x 4". Will adjust to fit a 65 inch chest or waist. To read full version of TALS 500 press release click here. 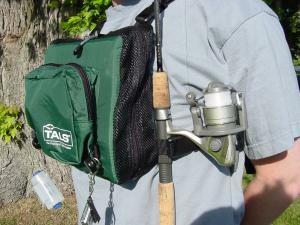 "When it comes to carrying tackle while wading or canoeing your favorite stream, the TALS 500 is the best system I have seen! I have been stream fishing for sixteen years and have tried just about every type of tackle-toting apparatus ever invented and none of them have been able to fulfill my needs like the TALS 500." "Your TALS 500 system was the answer to my prayers. I've been wade fishing the Mosquito Lagoon in Titusville, Florida for huge Redfish and Trout for many years. Your pack allows me the freedom to carry a large variety of plastics and plugs that are easily accessible and organized. 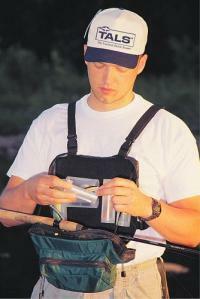 The shoulder straps also allow me to sheath my rod high and out of the water while I tie lines and unhook fish. The overall quality of the product is excellent and I recommend my local store, The FLY Fisherman of Titusville and Orlando, FL. to carry it. Thanks again."